Getting the chance to meet the company CEO, or learning to take apart complicated instruments and putting them back together again, are experiences that go beyond the average summer internship. That’s just the tip of the iceberg for students participating in the Roche Academy, a new program for chemistry and biology majors at the University of Indianapolis. The Roche Academy is a new partnership between Roche Diagnostics and the University of Indianapolis. 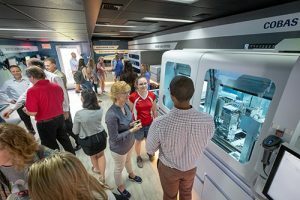 Co-developed with Ascend Indiana, a Central Indiana Corporate Partnership (CICP) initiative, the Roche Academy will create a custom talent pipeline for biomedical equipment technicians. With nearly 93,000 employees worldwide, Roche is the world’s leading biotech company with 17 biopharmaceuticals on the market, and was one of the first companies to bring targeted treatments to patients. Roche Diagnostics U.S. headquarters in Indianapolis is home to more than 4,500 employees. Students accepted into the Roche Academy will complete a Roche-customized curriculum path and summer internship experience focused on the hands-on, life science and engineering skills necessary for employment at Roche. Students successfully completing the program will receive financial and educational incentives, including a job offer from Roche upon graduation. “I gained skills in working with computers, hardware, and software that I did not have before. I also got to put soft skills into practice in a real world setting. I learned a little bit about the business world that I had never been exposed to as a chemistry major,” Durchholz said. David Styers-Barnett, chemistry chair, said Roche approached the University of Indianapolis with the opportunity. Faculty from chemistry, biology, engineering and physics worked with Roche to develop a curriculum. “They really liked how we all got in the room together and worked on this as a group. They felt our infrastructure would work for their needs,” Styers-Barnett explained. The program will be in full swing by 2019, and an August event on campus attracted dozens of students who toured Roche’s Navigator mobile lab, which features a virtual reality interactive display and examples of the instrumentation that Roche Academy students will learn to maintain. “As Roche’s customer base continues to grow, the demand for quality and properly trained biomedical equipment technicians continues to increase. These technicians are critical to Roche’s operations, as they maintain critical lab equipment and provide customer service across Roche’s 32 geographic service regions,” said Jim Floberg, vice president of Roche Support Network, Roche Diagnostics Corporation. The 2019 cohort will include ten students, growing to 25 by the third year of the program. “It’s a clear career path. It definitely offers students a unique opportunity with a major biomedical corporation that not a lot of undergraduate science students would otherwise have,” Styers-Barnett added. For Durchholz, the Roche Academy provided him access to industry mentors. “They helped me with the etiquette and find my way around. They became good friends who helped me succeed while at Roche. I know if I needed it, I could contact them and they would be more that happy to help me,” he explained. That experience also reflected the one-on-one mentorship he received at the University of Indianapolis – something he says is integral to student success in the chemistry program. “These relationships are why I have been successful and also why I was able to get this internship with Roche. UIndy has connections!” Durchholz said. Learn more about the Roche Academy. Written by Sara Galer, Senior Communications Manager, University of Indianapolis. Contact newsdesk@uindy.edu with your campus news.